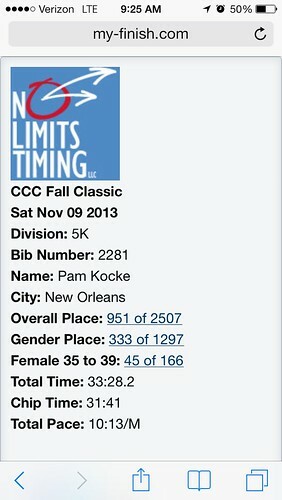 The last 5k I did was the CCFC last year, and this year, I was determined to beat my time. If you recall, I came within seconds of beating my PR last year, and I was not going to let it slip from my grasp again. Not that I’d done much training, but in the week prior, I’d run two miles in under 20 minutes twice (yes, practically faster than the speed of sound I am) so I thought I had a chance. I kept an eye on the weather all week, since I think last year, the heat was partly to blame for my time (I have to blame something other than myself, of course.) I was pleased to see it was supposed to be cool and cloudy. Perfect running weather! Much like the half-marathon last month, the weather ended up being picnic-perfect, but a bit sunnier than I’d like for a race. But at least it was cooler than last year. Plus, they changed the route so it seemed to me a bit shadier than last year. 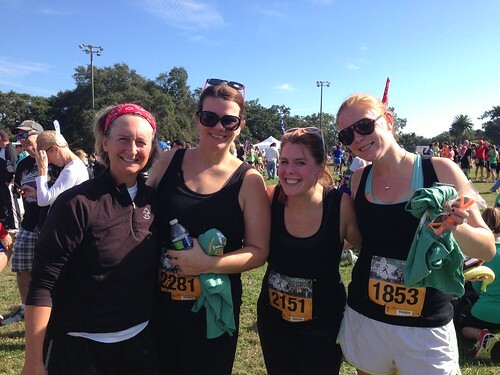 I went to the race with some friends – Chris, Steph, Heather, and Stacy. Chris was going for 28 minutes, and Heather, Stacy, and Steph were not going for a specific time. My real goal was to finish in under 32 minutes. A pretty tall order, considering I only needed to finish in under 32:26 to set a new PR. As the race started, I cued up the playlist I created, and then spent the first mile dodging walkers and people with strollers. Very frustrating. I wish the race organizers did more to remedy this. Alas. I wish I knew what my splits were, but turns out the app I chose to use won’t let you look at them? Weird. We’ll see. Anyway, the upshot is…I set a new PR! By a lot! After the race, we had bananas and Chee-Wees (best post-race food ever) and tiny Subway sandwiches. I beat these ladies! Woo! Ha ha! Now I’m even more determined to run more 5ks and fewer half marathons (as in, no more.) I may do one in December and see if I can…gasp…go even faster?! ?